A Quilter's Table: A Geometric W.i.P. It appears I only have w.i.p.s to share these days, but some weeks are like that. When I had a day to sew at the SMQG Meetup, I decided to work on something that wasn't even really on my to-do list and definitely not one of my projects with a deadline. Maybe not too clever, but it's something I've been wanting to tackle for a while, and I was anxious to work with my Imprint fabrics again. My chosen pattern, Geometric Sewing Machine by Kristy/Quiet Play, is paper-pieced and took me most of the day, but went together easily enough. Keeping my fabrics straight as I sewed along was the hardest part, and it helped me to mark my pattern pieces and focus on one color at a time. Over 20 different fabrics were needed, so I dug into my cherished Indelible, also by Katarina Roccella, for some additional coordinating fabrics, and still added a few odds and ends to balance the colors to my liking. I'm thinking the completed 16 1/2" block just might work its way into a nice sewing machine cover, so that'll go on the list. So the equation is kind of fuzzy . . . I accomplished something not on the list so I could add a new project to the list? That's the way it goes sometimes . . . I'm enamored with the color gradient here. Well done! I love the idea of a sewing machine cover made from this block ... I've been looking for a reason to make one and I think you just supplied it–thanks for the inspiration. This sewing machine is on my list of things to do. I love paper piecing and this project is just great. Love the way you did your colors. The colours are arranged beautifully! A cover would be prefect! That will make an awesome sewing machine cover. I have a little featherweight and it could use something like that for sure. Sounds like this new project was the perfect choice. Special fabric would stand guard of your machine nicely. Very cute!!! I love the color palette you used. I love this! Great inspiration for me as I have been admiring these and thinking I need t do one for me! Sounds like a great choice! Sometimes you just have to work on what you want to work on, deadlines and to do list be damned. What a cute sewing machine - and a great way to showcase a variety of fabrics and your style. I admired this one when I saw it on Instagram. Just super! And I am very familiar with that urge to work on something completely off the WIP list - that doesn't fit into any plans or deadlines. Why does this happen to us? Like I had all that FMQ to do and one evening sat down to cut and sew a little girl's dress. Go figure. But, it gets something out of our system, and we're refreshed to return to the must-dos. I think you did the right thing, following your urge. The result is great. This is really beautiful, it would make an excellent sewing machine cover. Beautifully done! Love the colors. It would indeed make a great sewing machine cover or a very fun sewing bag. It would be a gorgeous machine cover! How often do you cover your machine?! You are always working on amazing things, so you must never have an idle machine! And if you keep adding to your list, well...there you go, no rest for the weary (or sewing machines)! 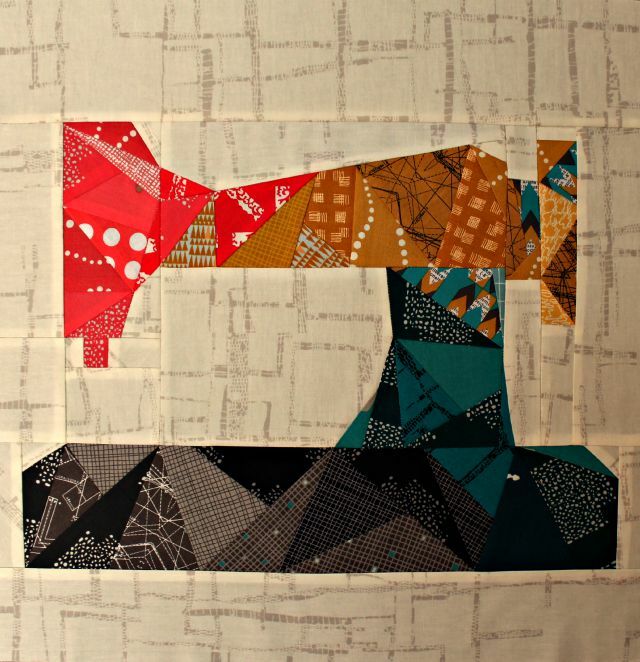 Love it, I designed a sewing machine block, but mine is really tiny and pieced not paper pieced. This one you did would be fun to try. It is sew fun! I love it! Beautiful, Debbie. I'm impressed with all those seams! The color gradient is lovely, and like Linda, I totally understand the urge to create. . . which creates another WIP. That's how it goes, right?